MegaPodTastic # 26: 2010 Year End Wrap Up! Krazy Joe and Dave bring 2010 to a close in the final show of the year! This week, Dave and Krazy Joe each pick their top ten High Fives of 2010!! Then, the Prediction Network peers into 2011 as Dave and Joe each pick the top five things they are excited for in the new year! To all our listeners and friends, thanks for your continued support. We hope to make the show even better in 2011! Happy New Year! MegaPodTastic # 25 Featuring 'Batman: Brave & the Bold' producers, James Tucker and Michael Jelenic !! Krazy Joe and Dave are joined by Michael Jelenic and James Tucker, producers of Cartoon Network's 'Batman: The Brave & The Bold' !!!!! This week, the Prediction Network looks at the remake of True Grit, 'Doctor Who: A Christmas Carol', David O. Russell's 'The Fighter', and Jack Black in 'Gulliver's Travels'. And we just don't know what the fock is up with 'Little Fockers'. And don't miss our interview with James Tucker and Michael Jelenic, producers on Cartoon Network's fantastic series, 'Batman: The Brave & the Bold'. Michael and James tease what to expect in the series 3rd season, and discuss their take on the caped crusader and his allies in the DC Universe! This is a great interview that you won't want to miss!! MegaPodTastic Episode 24 with Crash McLarson & Jimmy the Robot of the Aquabats!!!! The Following Takes Place Between 2:00 AM and 3:00 AM. Krazy Joe and Dave are joined by the Aquabats' Crash McLarson and Jimmy the Robot !!!!! Then it's time for our Earth shattering interview with two of the greatest superheroes/musicians to ever come to the United States from the continent of Aquabania in a hollowed out log: Crash McLarson, the second in command of the Aquabats and his faithful robotic friend, Jimmy the Robot!!! Crash and Jimmy tell us all the secrets of maintaining a career in music while fighting supervillains on the side. You don't want to miss this one, kids!! And the MegaPodTastic voicemail line gets some attention!! All this AND an all new McRib Report !! Krazy Joe and Dave are back with a fun filled 23rd episode! We give out lots of high fives! We sing the praises of AMC's 'The Walking Dead' (currently the best show on television! ), applaud JJ Abrams for his decision not to use Khan Noonien Singh as the villain in the upcoming 'Star Trek 12', and heap tons of love upon Paramount Pictures' 'Paranormal Activity 2', and recent Halloween themed episodes of our favorite sitcoms! In a rage filled Damage Report, we mock Darren Aronofsky's God-awful title for his sequel to 'Wolverine', 'THE Wolverine'. We also express our distaste for Disney's decision NOT to release the 1982 original 'Tron' on Blu-Ray before the theatrical release of 'Tron Legacy'. We react to some pretty awful still photos that were released to promote the Broadway musical, 'Spider-Man: Turn Off the Dark', and blast the SyFy Channel for pulling the final episodes of the now-cancelled 'Caprica' off the schedule. MegaPodTastic Episode 22 Featuring Heather Langenkamp !! Krazy Joe and Dave have a treat for you -- no tricks here!! The usual segments like the 'Damage Report' and 'Prediction Network' are out the window today. Instead we bring you a full episode length interview with Heather Langenkamp !! Heather is currently the narrator and executive producer of 'Never Sleep Again: The Elm Street Legacy', and she also was one of the stars of the sitcom, 'Just the 10 of Us'. But who are we kidding?? You best remember her as NANCY THOMPSON, the hero who first defeated Freddy Kruger in 1984's 'A Nightmare on Elm Street'. Please remember to visit teefury.com on Monday, Nov. 1st! 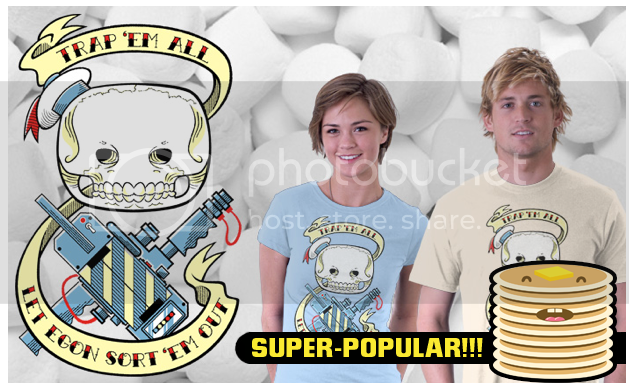 Friend to MegaPodTastic, Scott Derby, has a Ghostbusters themed t-shirt for sale for ONE DAY ONLY!!! Krazy Joe & Dave are joined by Robert Galluzzo, director of the new documentary, 'The Psycho Legacy'. 'The Psycho Legacy' is an in-depth documentary that goes behind the scenes of Hitchcock's 1960 classic, as well as its three sequels! Look for it on DVD on Tuesday, October 19th! In a new segment, The McRib Report, Dave & Joe discuss the return of McDonald's McRib sandwich on November 2nd. Please write to us or call to share your favorite McRib stories! Dave & Joe give out High Fives to David Fincher's 'The Social Network', and the DVD releases of 'How to Train Your Dragon' and 'Get Him to the Greek'. AMC Theaters (who were on last week's damage report) have redeemed themselves and get a high five for their October 23rd and 25th re-release of the classic 1985 film, 'Back to the Future'. NBC also get a High Five for giving a full 22 episode commitment for Chuck's current 4th season. The Damage Report looks at the disappointing new DVD release, 'House of The Wolf-Man', and Disney's dull 'Tron legacy' action figures. Dave and Joe also blast the ABC network for it's lame decision to hold back the second season of 'V' until January 2011. Dave Perillo returns to MegaPodTastic in our action packed 19th episode! 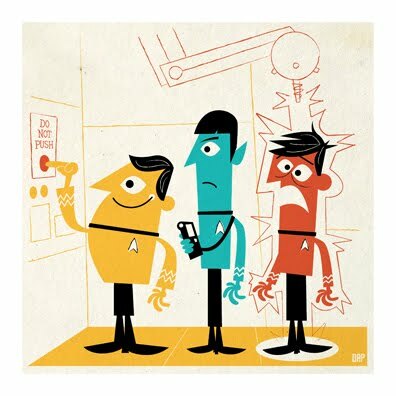 Also, Dave's Star Trek print, "The Expendables", will be available as a t-shirt for one day only! T-Shirts will be available on Wed September 23rd for one day only at http://www.teefury.com/. Be sure to get one, while you can! The Damage Report looks at the season finales of HBO's 'Entourage', and 'True Blood', and Robert Rodriguez's new movie, 'Machete'. Please send your comments to us at MegaPodTastic@gmail.com or give us a review on I-Tunes. (Or click our "donate" button!). Krazy Joe is joined by the hosts of the SciFi Pulse podcast, Ian Cullen and Wayne Hall for MegaPodTastic Episode 18! Wayne, Ian, and Joe give high fives to the new BBC series, 'Sherlock', USA's 'Burn Notice', Piranha 3D, and Steven Moffat's decision to split season 6 of 'Doctor Who' into two parts. ALSO, special High Fives from Mike Allred, Jimmy Palmiotti, Cliff Chiang, Amanda Conner, and Eric Powell. Next, Krazy Joe, Wayne, and Ian discuss the Baltimore Comic Con, which was held in Baltimore Maryland on Saturday August 28th and Sunday August 29th. Wayne Hall and Ian Cullen can be heard weekly on the SciFi Pulse Podcast. SciFi Pulse is available in the I-tunes store, and at Scifipulse.net. Dave Perillo & "Krazy Joe" Fiore are back with more nerdy loonacy! The Prediction Network Looks at 'Dinner for Schmucks', Christopher Nolan's 'Inception', Angelina Jolie's 'Salt', and the new season of 'Being Human' on BBC America. Joe and Dave also react to the first image of Ryan Reynolds in costume as Green Lantern. Joe and Dave give High Fives to the new seasons of 'Warehouse 13', and 'Eureka', and the movie 'Predators'. The Damage Report finally returns as Joe & Dave react to the news that Ed Norton will not be reprising his role as Bruce Banner in Joss Whedon's 'The Avengers', and the rumor that Matt Smith may not be the Doctor for too much longer. Dave also puts HBO's 'Entourage' on the Damage Report for it's lackluster current season. Dave and Krazy Joe are back to discuss the events of Wizard World Philadelphia 2010! Everything from artists, celebrity guests, and costumes are discusses as Joe and Dave talk about the Wizard convention they attended on the weekend of June 11th through the 13th. The Prediction Network looks at the new theatrical trailers for The Green Hornet and Red. M Night Shamylan's new critical disaster, 'The Last Airbender' is discussed.Joe and Dave also give predictions on the upcoming 'Predators', and the new season of Warehouse 13. High Fives are given to DC Comics' new hardcover graphic novel, 'Wednesday Comics', and the 'Justice League: Generation Lost' mini series. 'Toy Story 3', and the new MTV series 'Warren the Ape' and 'The Hard Times of RJ Berger' are also discussed. Krazy Joe and Dave are back with an interview with Lito Velasco, co-producer of 'Never Sleep Again: The Elm Street Legacy'. The Prediction Network Looks at 'Splice', 'The Hard Times of RJ Burger', and 'The Warren The Ape Show'. Joe and Dave also give High Fives to the new season of 'Doctor Who', 'Get Him to the Greek', the 25th anniversary celebration of 'The Goonies', and 'Never Sleep Again: The Elm Street Legacy'. Dave Perillo will have a table in the artist's ally section of the Wizard World Philadelphia convention on Friday 6/11/10, Saturday 6/12/10, and Sunday 6/13/10. Krazy Joe will also be covering the con for a future episode of MegaPodTastic.